Each person hast two sacroiliac joints, one on each side just below the waistline on the back side of the pelvis, not too far from the hip joint. 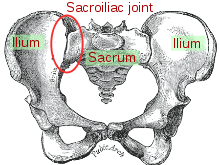 The sacroiliac joint lies next to the bottom of the spine – below the lumbar spine and above the tailbone (coccyx). 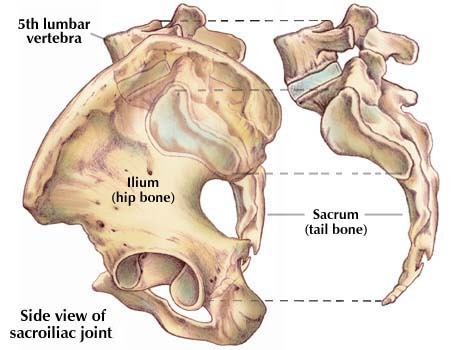 The SI joints, as the sacroiliac joints are sometimes called, are formed at the place where the sacrum connects with the two ilium (hip) bones. The sacroiliac joints are “kidney bean” or “L-shaped” and allow for only a small amount of movement, perhaps 2-16 degrees of normal movement. This small amount of movement allows a slight but complex pattern of twisting and rocking of the pelvis to occur when the legs are moved in a normal manner while walking. As a result the pelvis is able to gently rock or sway as we walk – women more than men – without much wasted lateral movement of the head. Only a minor part of the stability of the SI joints comes from the placement of the two joint surfaces against each other bony structure; the great majority of SI joint strength is due to a deep and complex group of intrinsic and extrinsic sacroiliac ligaments. The small movements of both sacroiliac joints are limited by the thick ligaments on the back of the pelvis that hold the SI joints together. Any painful or abnormal movement of the sacroiliac joints is typically due to weakness of the ligaments or excessive forces applied to the SI joints – or both. There are many different terms for painful sacroiliac joint problems, such as SI joint dysfunction, SI joint syndrome, SI joint dysarticulation, SI joint strain, and SI joint inflammation. Each term describes a different aspect of a problem in the SI joints that causes pain as a result of a variety of causes. Pain in the region of the sacroiliac joints is thought to be caused by inflammation of the ligaments and joint surfaces of the SI joints, or sacroiliitis. Growing evidence over the last 20 years suggests that lower back, that may be accompanied by thigh pain in the front or buttock pain with or without leg pain is commonly due to the inflammation of one or both of the sacroiliac joint(s), or sacroiliitis. Common problems of the sacroiliac joint that cause mild and diffuse ache or massive pain with limited movement and leg pain can be due to what is called sacroiliac joint dysfunction, also known as SI joint dysfunction. Sacroiliac joint dysfunction is a general term for variable pain in the area of the sacroiliac joint(s), caused by abnormal motion in the sacroiliac joint. This abnormal movement can be in the form of too much movement or too little movement. In either case, joint inflammation of the SI joint, or sacroiliitis, results because of this excessive or reduced movement. Too much movement causes instability, or the tendency to move more than normal or necessary. The pain that results is typically felt in the lower back and/or hip; it may extend into groin or upper thigh area. Too little movement causes fixation or a fixed or locked feeling in the joint with inability to move easily. This abnormal reduction of movement is irritating to the joint and eventually causes low back pain. The pain that results is typically felt on one side of the low back or buttocks, with possible radiation down the back of the leg, similar to sciatica. However, in SI joint fixation the leg pain usually remains above the knee, and rarely extends to the ankle or foot. It can be difficult to accurately diagnose a sacroiliac joint dysfunction because the symptoms are so similar to and overlap those from several common lower back pain problems, such as lumbar facet syndrome, disc herniation, and sciatic nerve radiculopathy. A diagnosis is usually arrived at through physical examination (eliminating other causes) and/or an injection (utilized to block the pain). Treatments for sacroiliac joint dysfunction (SI joint pain) are usually effective and are conservative in nature, designed to ultimately restore normal motion in the joint and provide low back pain relief. Because a high percentage of SI joint arthritis is the wear and tear type (osteoarthritis) treatment with acupuncture or acupressure can be extremely effective.